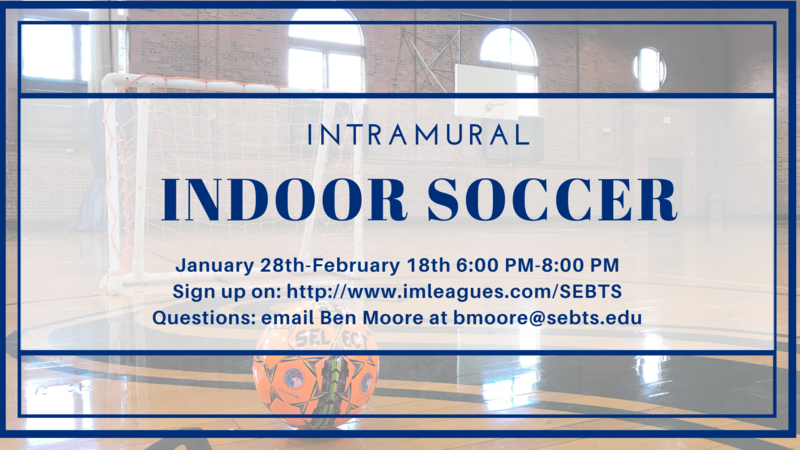 Exciting news: Intramurals at SEBTS is bringing intramural futsal back this spring! Now I know what some of you are thinking, what is Futsal? Futsal or indoor soccer, is a version of soccer that is played with a futsal ball which is slightly heavier than a regular soccer ball to prevent the ball from bouncing around and hitting the players. Futsal will be played with five players on each team and the games will be held inside the Ledford Center Gymnasium. The season will consist of four weeks, three weeks or regular season games with the fourth week being the tournament. Whether you think you have the skills of Ronaldo or Neymar, come out to enjoy a fun time of Christian fellowship through indoor soccer!